D.C. United is an American professional soccer club based in Washington, D.C. The club competes as a member of the Eastern Conference in Major League Soccer (MLS), the top level of professional American soccer. The franchise began play in 1996 as one of the ten charter clubs of the league. The club was one of the most successful clubs in the early years of MLS, winning eight of its thirteen titles between 1996 and 1998 under then head coach Bruce Arena. United holds the joint MLS record for most Supporters' Shields, has four MLS Cups, and been crowned U.S. Open Cup champions three times. It is also the first club to win both the MLS Supporters' Shield and MLS Cup consecutively. On the international stage, D.C. United has competed in both the CONCACAF Champions League and its predecessor, the CONCACAF Champions' Cup. The club won the 1998 CONCACAF Champions' Cup, making them one of only two MLS teams to ever win a CONCACAF tournament. Subsequently, United won the now-defunct Copa Interamericana in 1998 against Vasco da Gama of Brazil. This is the only intercontinental title won by an MLS club. The team's home field from 1996 to 2017 was the 45,596-seat Robert F. Kennedy Memorial Stadium, owned by the District of Columbia. The team moved into the new Audi Field, a soccer-specific stadium with a capacity of 20,000 at Buzzard Point just a few blocks from Nationals Park in July 2018. The team is owned by the consortium D.C. United Holdings. The team's head coach is former long-time starting midfielder Ben Olsen, who has coached the team since 2010. Jaime Moreno, Marco Etcheverry, and Eddie Pope are among the team's most successful stars. D.C. United's fan base includes four supporters' clubs. The club's official nickname is the "Black-and-Red" and home uniforms are black and white with accents of red. The team's name alludes to the "United" appellation commonly found in the names of soccer teams in the United Kingdom and elsewhere. Prior to the 1994 FIFA World Cup, the United States Soccer Federation fulfilled its promise to FIFA by aiding in the foundation of a new professional league. On June 15, 1994, Major League Soccer selected Washington, D.C. out of twenty-two applicants to host one of the first seven teams, with three more added before the league's launch. The team's name was chosen as a reflection of the names of European clubs, such as Manchester United or Leeds United. D.C. United won the 2004 Eastern Conference championship in what has been called one of the best games in MLS history. On April 6, 1996, D.C. United played in the league's inaugural match against the San Jose Clash in Spartan Stadium in San Jose, California. In the league's early years, D.C. was the most successful of all the teams in MLS. In their first year, coach Bruce Arena led the team to the first "double" in modern U.S. soccer history by beating the Los Angeles Galaxy in the first MLS Cup and the Rochester Raging Rhinos of the USL First Division in the 1996 U.S. Open Cup. D.C. repeated its MLS Cup victory in 1997 against the Colorado Rapids, in front of a home crowd at RFK Stadium. The team also experienced early success in CONCACAF competitions, winning both the Champions' Cup and the Interamerican Cup in 1998. In October 1998, Arena left DC United to coach the U.S. men's national team. Arena's departure marked the beginning of a downturn in the team's fortunes. While the club again won the MLS Cup in 1999 under coach Thomas Rongen, lackluster results in 2000 and 2001 led to Rongen's departure and his replacement by Ray Hudson in 2002. The team did not, however, fare much better under Hudson, and Piotr Nowak replaced him before the start of the 2004 season. The club's first season under Nowak was marred by injuries in the early going, and some players were known to have complained about Nowak's methods. Nevertheless, a strong finish, assisted in large measure by the late-season acquisition of Argentine midfielder Christian Gómez, who helped to propel United into the playoffs as the second seed. There they advanced past the New England Revolution on penalty kicks in what has been called one of the best games in MLS history. United then defeated the Kansas City Wizards to win their fourth MLS Cup. United's attendance record at RFK Stadium is 54,282, in a match against the Tampa Bay Mutiny in 2001. On November 18, 2003, MLS made sports history by signing Freddy Adu, a 14-year-old soccer prodigy and on January 16, 2004, he was officially selected by United with the first pick in the 2004 MLS SuperDraft. When Adu entered United's regular-season opener as a second-half substitute on April 3, 2004, he became the youngest player in any professional sport in the United States since 1887. 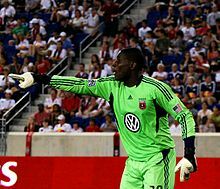 On December 11, 2006, D.C. United traded Adu and goalkeeper Nick Rimando to Real Salt Lake in exchange for a major allocation, goalkeeper Jay Nolly, and future considerations. In 2005, the club again made MLS history by becoming the first United States-based team to participate in Copa Sudamericana, entering in the Round of sixteen. Since 2006, United has played well against international competition, beating Scottish champions Celtic F.C. and drawing Real Madrid in Seattle. In addition, the 2006 MLS All-Star Team, which included eight United players and was managed by United's manager Piotr Nowak, defeated English champions Chelsea. In 2006 and 2007, United became the first club in league history to win the MLS Supporters' Shield consecutively. Since winning back-to-back Shields in 2006 and 2007, the club failed to qualify for the MLS Cup Playoffs five years in a row. During this stretch, United's lone major title came in 2008, when they won the U.S. Open Cup. In league play during the 2008 and 2009 campaigns, United faltered at the tail-end of each season, ultimately causing them to miss out on the playoffs. They had a poor 2010 MLS season, winning only six matches, drawing four and losing 20. In 2011, United again failed to qualify for the playoffs in the second to last week of the campaign. In 2012, United returned to the playoffs for the first time in five years, clinching a berth in the second-to-last week of the season. D.C. United tallied a total of only three wins in the 2013 season, setting a record for fewest wins in league history. Despite the team's poor showing in league play, D.C. United defeated Real Salt Lake in the U.S. Open Cup final. This qualified the team to participate in the 2014–15 CONCACAF Champions League. In 2014, D.C. United executed a historic turnaround by clinching first place in the Eastern Conference, which also earned the team its second consecutive Champions League berth. The team's colors and original logo were announced on October 17, 1995, along with those of the other ten original teams during a presentation in New York City. Black and white are D.C. United's primary colors, though the team's nickname is the "Black-and-Red." Red is used to accent the home jersey while white is the main color of the team's road uniform. The three stripes along the shoulder – in white at home and black on the road – do not represent the three jurisdictions of the Washington Metropolitan Area (Washington, D.C., Maryland, and Virginia); rather, they represent the fact that the team's uniforms are made by Adidas. United's shirt sponsor is Reston, Virginia defense company Leidos. In 2011, the team introduced a predominantly red third uniform with black accents to be worn four or more times in the season. The team has also previously used white road uniforms with red stripes; white and red are the colors of the flag of Washington, D.C., and the stripes are also reminiscent of those used on the flag. The team's original shield was implemented in 1996 consisting of the team's name, D.C. United, above a black bald eagle facing right on a red field, clawing three soccer balls overlaid on three white stars. The three stars and balls were intended to represent the region's three jurisdictions. The bird, associated with the federal government based in Washington, D.C., symbolizes many of the attributes of the team, including speed and power. The logo was redesigned before the 1998 season. This second logo design reoriented the eagle facing left, and removed the three stars below it, whose metaphor was retained by three raised wing feathers. At the center of the eagle is a single gold-colored star and soccer ball, which represents the team's victory in Major League Soccer's inaugural cup in 1996. The logo can also be adorned with four silver stars above it, representing the MLS Cups the team has won. On December 10, 2015, D.C. United unveiled an updated logo designed by Peter Horridge, featuring a D.C. flag-inspired design across the eagle, an updated wordmark, and more dynamic wings. Leidos was announced as the main jersey sponsor on February 24, 2014, for a multi-year agreement, replacing the previous sponsor Volkswagen Group of America. Other sponsors include Adidas, Chipotle Mexican Grill, GEICO, Verizon Wireless, and Papa John's Pizza. RFK Stadium was the first home to D.C. United. Robert F. Kennedy Memorial Stadium (RFK) was home to D.C. United from the club's founding in 1996 until the end of the 2017 season. The D.C. United Training Complex is located north of the stadium, and is where the Reserve Division team plays. RFK was built in 1961 as a dual-use stadium for baseball and American football. Before 1996, it occasionally hosted soccer matches, including the 1980 Soccer Bowl, the 1993 Supercoppa Italiana, and five matches during the 1994 FIFA World Cup. When the Washington Nationals baseball team shared the field from 2005 to 2007, there were criticisms about the playing surface and the dimensions of the field. Audi Field is a soccer-specific stadium at Buzzard Point in Southwest, Washington, D.C., and has a capacity of 20,000. It hosted its first game against Vancouver Whitecaps FC on July 14, 2018. The stadium's naming rights are owned by Audi, who signed a 12-year contract in February 2017. It was designed by Populous and Marshall Moya Design. Plans for a new stadium dated back to July 2006, when D.C. United proposed building a new stadium along the Anacostia River near Anacostia Park, but disputes with the city government forced the team to consider other sites. The tentative deal for the stadium was announced on July 25, 2013 which would see a 20,000–25,000 seat stadium built on the site, costing $300 million. It was signed into law on December 30, 2014. Groundbreaking began on February 27, 2017 and the ribbon cutting was on July 9, 2018. Several regional university stadiums have been used by the team for Lamar Hunt U.S. Open Cup matches, including Klöckner Stadium in Charlottesville, Virginia in 1996, and George Mason Stadium in Fairfax, Virginia in 2010. Similarly, the team has also used the Maryland SoccerPlex in Germantown, Maryland for multiple early-round games in U.S. Open Cup and CONCACAF Champions' Cup since it opened in 2001. On April 14, 2018 D.C. United played an MLS game against Columbus Crew SC at the Navy–Marine Corps Memorial Stadium in Annapolis, Maryland while Audi Field was being constructed. Exhibition games, as well as occasional regular season matches, have also been played in nearby FedExField in Landover, Maryland; the latter have generally been played as part of doubleheaders featuring friendlies between national teams or foreign clubs. D.C. United has four major supporters groups; La Barra Brava, the Screaming Eagles, La Norte and the District Ultras. Each group has a designated section of the home stadium. La Barra Brava, Spanish for "The Brave Fans", was founded in 1995 by Latino fans in the Washington, D.C. area, mostly Bolivian immigrants in support of original United players Marco Etcheverry and Jaime Moreno. They seek to bring a South American style to home games. All four clubs host public tailgates before home matches, and are known for singing during games. La Norte, which takes its name from its location on the north side of the stadium, is noted for its streamers, large drum, and harassment of the opposition. 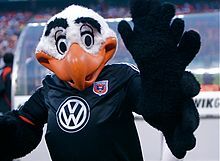 D.C. United's mascot is Talon, an anthropomorphic bald eagle. When the league was founded in 1995, billionaire investor George Soros was the primary financial backer and director of Washington Soccer L.P., the group that owned the operating rights to D.C. United. Kevin Payne, former President of Soccer USA Partners and current CEO of D.C. United, was instrumental in organizing this ownership group. By 1998 the group was looking for new investors, and on February 15, 2001, it agreed to sell the team to Anschutz Entertainment Group (AEG), founded by Colorado billionaire Philip Anschutz, with AEG exercising its option to become the sole investor-operator on January 8, 2002. AEG, who also own Major League Soccer's Los Angeles Galaxy and Houston Dynamo, ran the team until 2007. In May 2007, United entered into an initial one-year strategic partnership with Brazilian club Atlético Mineiro. The goal of the partnership is to enhance the sporting and commercial success of the respective clubs by sharing expertise and experience as well as creating new opportunities for the clubs in both areas. On January 8, 2007, the operating rights to D.C. United were sold to D.C. United Holdings, a newly formed group venture that included real estate developer Victor MacFarlane, founder of MacFarlane Partners, and William H.C. Chang, chairman of Westlake International Group. Other investors included D.C. United president Kevin Payne and Blue Devil Development, headed by former Duke basketball players Brian Davis and Christian Laettner. In April 2009, Victor MacFarlane sold his share of the team to his partner William Chang after two stadium proposals had fallen through. In October 2009, Chang also bought out Davis and Laettner to fully control the team. Chang is also one of the primary investors of Major League Baseball's San Francisco Giants. In July 2012, Erick Thohir and Jason Levien, minority owners of the Philadelphia 76ers National Basketball Association franchise, joined Chang as partners. Thohir and Levin stated their primary goals are to make United a global brand and build a soccer-specific stadium for the club. Beginning with the 2019 season, rights to D.C. United matches not covered by one of MLS' national television partners (ESPN, FS1, and Univision) are held by FloSports. D.C. United joined Chicago Fire and Los Angeles FC in selling their local rights to a subscription over-the-top service rather than a traditional television broadcaster. Commentators are Dave Johnson and Devon McTavish. Comcast SportsNet Washington held television rights from 1996 through 2015, dating back to its time as Home Team Sports. In CSN's final three-year deal, which was not completed until five games into the 2013 season, it was to show a minimum of 16 matches per season. The team became frustrated that late-season and playoff matches were often relegated to the network's secondary "CSN+" feed or not televised at all due to scheduling conflicts with the Washington Capitals and Washington Wizards, leading them to seek a new deal for the 2016 season. The 2016 contract was awarded to Sinclair Broadcast Group, who placed their games on local cable channel WJLA 24/7 News (previously NewsChannel 8). To replicate the regional coverage that CSN had, Sinclair syndicated games to a network of their stations in Virginia and Baltimore in 2016. The network was reduced to just WUPV (channel 65) in Richmond for the final two seasons of the contract. Two matches in the 2017 season were moved to free TV in Washington, on Sinclair ABC affiliate WJLA-TV. No such broadcasts were scheduled for the 2018 season. D.C. United's first radio partner was WMET (1160 AM), which picked up coverage in 2003. For the 2009 season, games moved to WTOP (1050 AM), but the station did not renew its deal and the team went the next four seasons without English-language radio. Tony Limarzi was the commentator. WACA (1540 AM) broadcast commentary in Spanish from the team's founding through the 2009 season. In 2010, coverage moved to WDCN-LP (87.7 FM) through the end of the 2012 season. Coverage in both languages returned for the 2014 season, as D.C. United entered into a four-year deal with CBS Radio, including English commentary on WJFK-FM (106.7 FM) or WJFK (1580 AM) and Spanish on WLZL-HD2 (107.9 FM-HD2). The contract with CBS Radio expired after the 2017 season, and the team currently does not have any radio coverage. For details on former players, see All-time D.C. United roster. For player records, including player awards, see List of D.C. United records and statistics. Bill Hamid was D.C.'s first Academy signing. The D.C. United Academy is the youth and development program for D.C. United. The program consists of four levels: the under-23 and under-20 teams, as well as the Academy (U-18/17 & U-16/15) and Pre-Academy teams (U-14, U-13). While the U-23 team plays in the fourth tier, USL Premier Development League, the U-20 team plays in the Super-20 League, and the Academy and Pre-Academy teams play in the U.S. Soccer Development Academy leagues. Notable players to have graduated from the D.C United Academy include Bill Hamid, who has been called up by the U.S. national team, and Andy Najar, who has been capped for Honduras. Ben Olsen took over head coaching duties in August 2010. 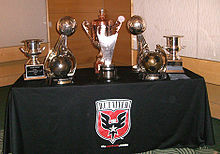 D.C. United trophy collection as of 2007. Statistics below show the all-time regular-season club leaders. Bold indicates active D.C. United players. Jaime Moreno holds most of D.C. United's offensive records. In 2003, D.C. United introduced the "Hall of Tradition" (formerly "Tradition of Excellence"), an honor bestowed upon players, coaches & front office staff deemed by United to have been crucial to the team's success. People are listed in the order in which they joined the club. Banners for the "Hall of Tradition" members are displayed at RFK Stadium. MLS statistics sourced to: Litterer, David. "Major League Soccer". Rec.Sport.Soccer Statistics Foundation. Retrieved July 13, 2011. U.S. Open Cup statistics sourced to: Hikala, Josh. "1995 – present (Pro Era)". TheCup.us. Retrieved July 13, 2011. CONCACAF statistics sourced to: Torres, Steven. "CONCACAF Champions Cup and Champions League history" (PDF). CONCACAF. Archived from the original (PDF) on September 16, 2011. Retrieved July 13, 2011. Top scorers sourced to: "Statistics". Major League Soccer. Retrieved July 12, 2011. ^ "D.C. United History". Major League Soccer. Retrieved December 11, 2015. ^ Montgomery, Matt (July 17, 2013). "Brandon McDonald: The D.C. United perspective with Black and Red United". RSL Soapbox. Retrieved August 29, 2013. ^ Bruh, Molly (August 12, 2013). "Bryce Harper reps the Black-and-Red in an interview with CSN". D.C. United. Retrieved December 12, 2015. ^ a b c "History & Tradition". D.C. United. Retrieved July 12, 2011. ^ "PLUS: SOCCER – CONCACAF CUP; D.C. United Wins Tournament". The New York Times. August 17, 1998. Retrieved July 12, 2011. ^ "D.C. United downs Vasco da Gama to take InterAmerican Cup". CNN/SI. December 7, 1998. Retrieved July 12, 2011. ^ Lugo, Erik Francisco (October 12, 2004). "Copa Interamericana 1998". Rec.Sport.Soccer Statistics Foundation. Retrieved November 19, 2016. ^ Goff, Steven. "D.C. United executive discusses Buzzard Point stadium, ownership, jersey sponsor". Washington Post. Retrieved December 20, 2015. ^ a b Kravitz, Derek (June 18, 2009). "Fans Asked to Choose Where Team Should Find New Home". The Washington Post. Retrieved July 9, 2009. ^ "Supporters Clubs". D.C. United. Retrieved March 5, 2014. ^ "Football Culture. Names Explained". British Council Korea. Archived from the original on February 3, 2008. Retrieved December 11, 2006. ^ a b c d e "General Overview". Major League Soccer. 2009. Archived from the original on June 25, 2008. Retrieved June 26, 2009. ^ "America's one and only United". FIFA. September 24, 2008. Archived from the original on October 28, 2008. Retrieved September 6, 2009. ^ a b "D.C. United Tradition". Major League Soccer. 2007. Archived from the original on January 19, 2010. Retrieved July 20, 2011. ^ Wise, Mike (November 13, 2004). "Nowak Creates A United State". The Washington Post. Retrieved July 20, 2011. ^ Dure, Beau (November 11, 2004). "Harkes keeps both feet in the soccer world". USA Today. Retrieved June 19, 2007. ^ Dell'Apa, Frank (July 26, 2005). "10 of the best... MLS games". ESPN. Retrieved July 20, 2011. ^ Goff, Steven (November 3, 2006). "Revolution Ready to Take Another Shot". The Washington Post. Retrieved June 19, 2007. ^ "D.C. United & Comcast SportsNet to launch 'Brunch with D.C. United'". Major League Soccer. January 25, 2006. Archived from the original on October 14, 2007. Retrieved June 19, 2007. ^ Lifton, David (May 11, 2005). "Looking back: Unforgettable in every way". Major League Soccer. Archived from the original on April 7, 2007. Retrieved June 19, 2007. ^ "Major League Soccer – Tampa Bay vs. D.C. United". USA Today. Retrieved December 20, 2015. ^ Couso, Jose. "DC United attendance". Big Soccer. Retrieved December 20, 2015. ^ Slater, Matt (November 22, 2006). "Doubts raised in US over Adu move". BBC News. Retrieved July 20, 2011. ^ "Ready for Freddy! Real Salt Lake acquires teen phenom Freddy Adu from D.C. United". mlsnet.com. December 11, 2006. Archived from the original on May 20, 2007. Retrieved July 20, 2011. ^ "United Ousted From Copa Sudamericana". The Washington Post. September 23, 2005. Retrieved July 20, 2011. ^ Shatzer, Martin. "D.C. United 3–2 Columbus Crew: Late Winner Clinches Return To MLS Playoffs". BlackAndRedUnited.com. SB Nation – Black and Red United. Retrieved October 21, 2012. ^ a b Goff, Steven (October 3, 2013). "Stats, scores and schedules". The Washington Post. ^ Straus, Brian. "D.C. United finishes first in Eastern Conf., completes historic turnaround". Sports Illustrated. Retrieved January 6, 2016. ^ February 24, 20147:46AM ESTdcunited.com (September 27, 2013). "Leidos becomes official sponsor of". D.C. United. Retrieved January 9, 2017. ^ Goff, Steve (January 29, 2011). "D.C. United introduces a third jersey". The Washington Post. Retrieved February 8, 2011. ^ Hicks, Doug. "D.C. United S.C." FootballCrests.com. Retrieved June 6, 2009. ^ MLSsoccer staff (December 10, 2015). "DC United unveil updated team logo for only the second time in club history". Major League Soccer. Retrieved December 11, 2015. ^ Goff, Steven (December 10, 2015). "D.C. United unveils a new logo". The Washington Post. Retrieved December 11, 2015. ^ "Team Uniform History: 1996–2005". MLSnet.com. D.C. United. Archived from the original on November 16, 2008. Retrieved August 30, 2011. ^ Goff, Steven (May 6, 2008). "United Takes Volkswagen Out for a Spin". The Washington Post. Retrieved September 20, 2011. ^ "United to Ascend". Archived from the original on February 28, 2014. ^ "Leidos becomes official sponsor of D.C. United". February 24, 2014. ^ "D.C. United Corporate Partners". D.C. United. 2009. Archived from the original on August 15, 2009. Retrieved June 6, 2009. ^ "D.C. United Academy Camps: Directions". D.C. United. 2009. Archived from the original on July 5, 2008. Retrieved July 9, 2009. ^ Goff, Steven (April 26, 2005). "MLS Officials: United Played on Irregular Field". The Washington Post. Retrieved May 27, 2009. ^ Giambalvo, Emily (July 14, 2018). "D.C. United debuts Audi Field, and Wayne Rooney, in a convincing win over Vancouver". The Washington Post. Retrieved July 14, 2018. ^ Goff, Steven. "D.C. United strikes deal with Audi for stadium naming rights". The Washington Post. February 15, 2017. ^ Bromley, Ben (February 15, 2014). "New D.C. United Stadium Renderings, by Architecture Firm Populous, Released". SB Nation. Retrieved June 3, 2014. ^ Hansen, Drew (April 21, 2016). "D.C. United Stadium Has a Name (at Least Tentatively)". Washington Business Journal. Retrieved June 3, 2016. ^ Nakamura, David (July 21, 2007). "Talks Fall Apart on Stadium for D.C. Soccer Team". The Washington Post. Retrieved September 6, 2009. ^ "Deal reached for new stadium". StadiaDirectory. July 25, 2013. Archived from the original on September 27, 2013. Retrieved July 25, 2013. ^ "Term Sheet DC United Stadium Project" (PDF). District of Columbia and DC Soccer LLC. District of Columbia Office of the City Administrator. July 25, 2013. Archived from the original (PDF) on March 4, 2016. ^ "Mayor Gray signs bill to fund DC United soccer stadium". WUSA 9. December 30, 2014. Retrieved March 7, 2015. ^ Rodriguez, Alicia (February 16, 2017). "DC United announce stadium groundbreaking ceremony on February 27". MLSsoccer.com. Retrieved February 17, 2017. ^ Giambalvo, Emily (July 10, 2018). "D.C. United ushers in 'a new era' with Audi Field ribbon-cutting ceremony". Washington Post. Retrieved July 10, 2018. ^ DeNunzio, Jon (September 5, 1996). "United Wins in Arena's Return to U-Va". The Washington Post. Retrieved May 28, 2011. ^ Tenorio, Paul (June 30, 2010). "U.S. Open Cup: D.C. United beats Richmond Kickers behind Jaime Moreno". The Washington Post. Retrieved May 28, 2011. ^ Goff, Steven (August 25, 2005). "United Loses a Shot at U.S. Open Cup". The Washington Post. Retrieved May 28, 2011. ^ Goff, Steven (July 21, 2009). "United Has Plenty to Do Before Open Cup Semis". The Washington Post. Retrieved May 28, 2011. ^ Goff, Steven (March 16, 2005). "D.C. United Sees Danger in View". The Washington Post. Retrieved May 28, 2011. ^ "D.C. United holds off Columbus Crew SC in Annapolis". ESPN FC. April 15, 2018. Retrieved July 29, 2018. ^ McDaniel, Ash (August 8, 2009). "60,000-plus expected for Real Madrid-DC United". ESPN. Associated Press. Retrieved May 28, 2011. ^ Maurer, Pablo. "D.C. United struggle with unfamiliar playing surface at FedExField in scoreless Columbus Crew draw". MLSsoccer.com. Retrieved December 20, 2015. ^ a b "Supporters Club". D.C. United. DCUnited.com. Retrieved December 20, 2011. ^ "About Us". La Barra Brava. December 24, 2007. Archived from the original on June 12, 2008. Retrieved September 20, 2011. ^ Goode, Harlan (June 25, 2008). "In the trenches with soccer's craziest fans". The Washington Times. Retrieved September 20, 2011. ^ "About". La Norte. February 26, 2009. Archived from the original on September 28, 2011. Retrieved September 20, 2011. ^ "Talon". Retrieved June 11, 2013. ^ FoxSports (October 1, 2011). "Union and United: Building animosity". Latino.foxnews.com. Fox News Latino. Retrieved October 14, 2011. ^ Dave Zeitlin (August 20, 2012). "The Inside Doop: Union-D.C. United rivalry". Archived from the original on June 16, 2013. Retrieved June 14, 2013. ^ "Battery set for Open Cup rematch with DC United". Charleston Battery. March 14, 2009. Archived from the original on February 22, 2012. Retrieved September 20, 2011. ^ Goff, Steven (October 12, 2000). "United's Ownership Uncertain; After Sale Fell Through, MLS Might Take Over Operation". The Washington Post. Retrieved September 20, 2011. ^ "D.C. United enters into strategic partnership with Brazil's Clube Atlético Mineiro". D.C. United Media Relations. May 4, 2007. Archived from the original on December 31, 2008. Retrieved June 27, 2009. ^ "MacFarlane leads group in purchase of Major League Soccer's D.C. United". D.C. United Media Relations. January 8, 2007. Archived from the original on February 2, 2008. Retrieved June 27, 2009. ^ Boehm, Charles (August 24, 2009). "Chang assumes control of DC United". Major League Soccer. Retrieved September 20, 2011. ^ Goff, Steve (October 21, 2009). "DCU Ownership, Olsen, USA Friendlies". The Washington Post. Retrieved September 20, 2011. ^ Stein, Marc (July 6, 2012). "Philadelphia 76ers minority owners to purchase DC United of MLS". ESPN. ESPN.com. Archived from the original on July 9, 2012. Retrieved July 6, 2012. ^ "DC United sign multi-year MLS streaming deal with FloSports". SportsPro. Retrieved January 9, 2019. ^ Goff, Steven. "D.C. United reaches 3-year deal with CSN". The Washington Post. Retrieved April 4, 2013. ^ a b "D.C. United matches to appear on NewsChannel 8, ABC7". Washington Post. Retrieved December 20, 2015. ^ a b "2018 Broadcast Schedule". D.C. United. ^ Goff, Steven (February 11, 2016). "Dave Johnson expected to return as D.C. United TV announcer but analyst undecided". Washington Post. ^ "2017 Broadcast Schedule". October 20, 2017. Archived from the original on October 20, 2017. ^ "D.C. United Announces 2003 Season Sponsors". April 17, 2003. ^ Morissey, Aaron (May 17, 2009). "This Is Your D.C. United: Tony Limarzi". DCist. ^ Wiseman, Lauren (October 26, 2008). "A Resounding Hometown Enthusiasm". The Washington Post. ^ "D.C. United to partner with La Nueva 87.7 FM for Spanish-language radio broadcasts". D.C. United. January 20, 2010. ^ "D.C. United, CBS Washington announce multi-year partnership". DC United official website. Retrieved October 28, 2016. ^ Goff, Steven. "D.C. United news and notes". Washington Post. ^ "Players". D.C. United. Retrieved January 24, 2017. ^ "D.C. United to launch youth academy residency program in Maryland", Washington Post, Steven Goff, February 19, 2015. ^ "Orlando City eager to build strong pipeline from developmental academy to MLS level", Orlando Sentinel, Paul Tenorio, July 4, 2015. ^ "CONCACAF Cup". RSSSF. Archived from the original on January 12, 2016. Retrieved October 20, 2016. ^ a b "Trophies by mls club". Major League Soccer. Retrieved October 20, 2016. ^ "D.C. United All-Time Leaders". Major League Soccer. August 22, 2009. Archived from the original on May 15, 2008. Retrieved June 22, 2013. ^ DC United (November 28, 2018). "Rooney named United's 2018 MVP, Golden Boot winner". www.dcunited.com. Retrieved November 28, 2018. ^ "D.C. United: Fans: D.C. United Hall of Tradition". Major League Soccer. 2008. Archived from the original on October 18, 2008. Retrieved June 27, 2009. ^ "INTERNATIONAL PARTNER CLUBS". Retrieved June 29, 2018. ^ "D.C. United adds Richmond Kickers as minor league affiliate", Washington Examiner, January 24, 2013. Wikimedia Commons has media related to D.C. United. Soccer clubs in Washington, D.C.
1995 establishments in Washington, D.C. This page was last edited on 24 April 2019, at 00:48 (UTC).